You gotta eat more meat! If you're a fan of JRPG's often wacky stories, you may be interested in the visual novel about dating pigeons, Hatoful Boyfriend. Hatoful Boyfriend boasts the chance to be a lone human in an-all pigeon school and features dating sim mechanics and multiple endings. I have the game in my Steam library, but the cross-buy feature between PS4 and Vita makes it tempting to purchase again (Yeah, what up first world problem?). Other than a hint of Deception DLC, the PSN's pretty quiet on the JRPG front. Hopefully next week is better, but otherwise go date some pigeons! Have a good week and happy gaming! 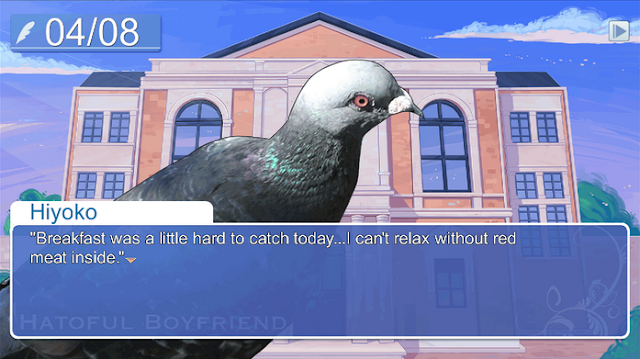 Pick of the week: Hatoful Boyfriend. How many games can you date a pigeon in, seriously?